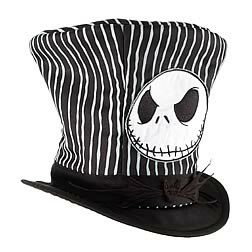 Nightmare Before Christmas Jack Skellington Top Hat. This top hat is made of the finest cotton twill fibers and features a lovely pinstriped detailing. Embroidered Jack Skellington patch also features suede bat bow tie and a grosgrain ribbon band. It comes with a size adjuster. Order yours today! Ages 14 and up.